The European Economic and Social Committee [EESC] is an EU advisory body comprising representatives of workers’ and employers’ organizations. It issues opinions on EU issues to the European Commission, the Council of the EU and the European Parliament, thus acting as a bridge between the EU’s decision-making institutions and EU citizens. During “Europe 2020” [Brussels, summer 2015] I co-hosted the conference together with the chair of the organization. 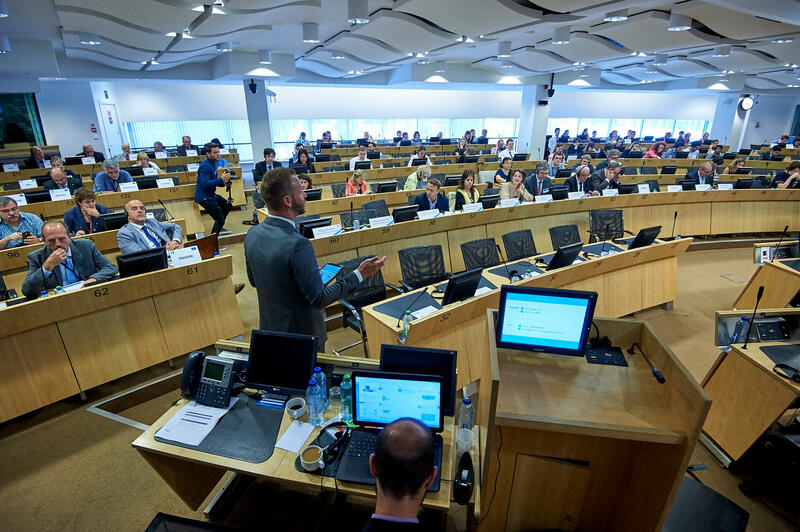 Throughout the day the audience reflected on the current Europe 2020 strategy. A strategy that has 5 objectives with which it wants to boost economic growth and employment: more research investments, less gas emission, less early school leavers, more employment, less poverty]. At the conference Sendsteps was used to measure how the audience judged the results of the committee, but also to ask questions to panels. As it can easily happen in the political arena that attendees take a lot of time to make their point, we choose to use Sendsteps; this way we could steer better and get to the core. I coordinated both the live and digital contributions from the experts in the audience. Since everyone can speak his/her own language in the committee, I worked together with an interpreter to channel and bring forward all audience responses in English. Through this approach much more could be discussed, tackled and brought up then without my contribution and the use of Sendsteps. The result was a very satisfied board!